Today marks the start of our year of discernment. Please pray for us in our project of starting a traditional Benedictine monastery in Great Britain. Excita, quaesumus, Domine, potentiam tuam et veni; ut ab imminentibus peccatorum nostrorum periculis, te mereamur protegente eripi, te liberante salvari. Stir up, we beseech thee, O Lord, thy power and come; that by thy protection we may be freed from the imminent dangers of our sins, and be saved by thy mercy. Lesson of the Epistle of St. Paul the Apostle to the Romans. Brethren, know that it is now the hour for us to rise from sleep. For now our salvation is nearer than when we believed. The night is passed, and the day is at hand. Let us therefore cast off the works of darkness, and put on the armour of light. Let us walk honestly, as in the day: not in rioting and drunkenness, not in chambering and impurities, not in contention and envy: but put ye on the Lord Jesus Christ. 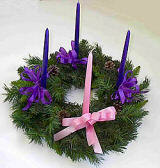 In Thy Advent O Lord, Have mercy on us. Our Lady, Queen of Monks, Pray for us.